How are age, employment, and happiness related? 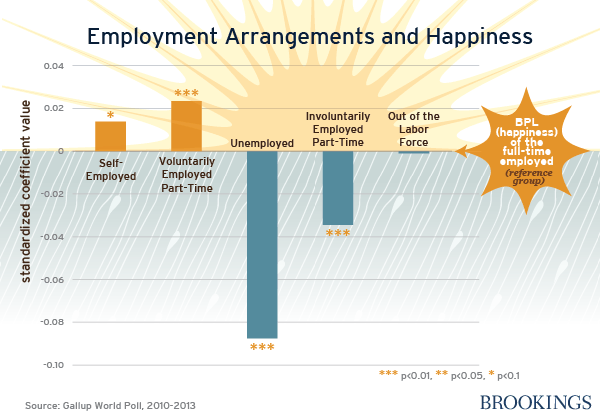 Four charts in Carol Graham and Milena Nikolova’s latest paper illustrate that flexible employment arrangements are linked to higher happiness levels. For more, listen to a new podcast. In the past few years, economists and other social scientists have made great strides in developing measures to assess subjective well-being (or, more colloquially, happiness), which has deepened our understanding of well-being beyond the traditional income dimensions. There are remarkably consistent patterns in the determinants of subjective well-being across people within and across countries and cultures around the world. 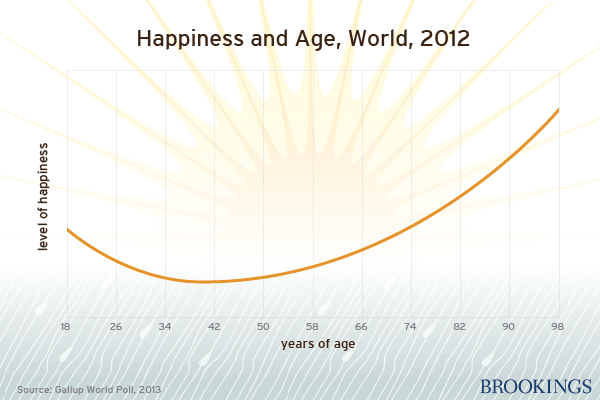 One of the most striking of these is the relationship between age and happiness (which is good news for those of us who are already on the “back-nine”). There is a U-shaped curve, with the low point in happiness being at roughly age 40 around the world, with some modest differences across countries. It seems that our veneration of (or for some of us, nostalgia, for) youth as the happiest times of our lives is overblown, the middle age years are, well, as expected, and then things get better as we age, as long as we are reasonably healthy (age-adjusted) and in a stable partnership. There are other consistent patterns. 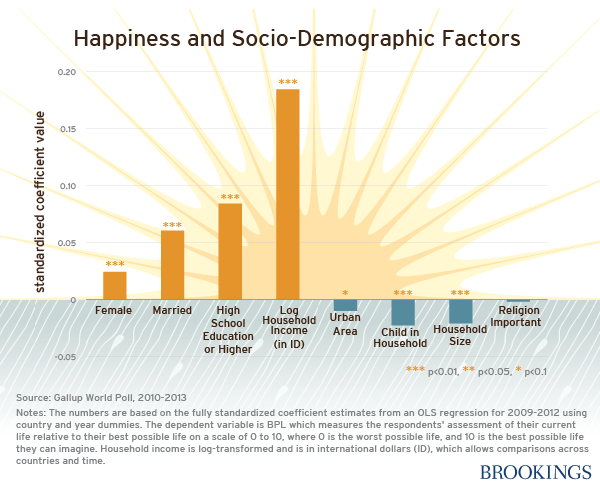 Income matters to individual happiness in every context we have studied this relationship. Yet after basic needs are met, other things like how your income compares to that of your peers also start to matter. Moreover, married people (and those in a civil union) are typically happier than their non-married counterparts (there is a direction-of-causality-issue here, though, as happier people are more likely to marry each other); healthier people are happier; and women are, in most places, happier than men (as long as gender rights are not severely compromised). Another variable that is absolutely critical for subjective well-being is employment status. The unemployed are less happy than the employed worldwide. And both psychologists and economists find that long-term unemployment has psychological scarring effects. Long-term unemployment and under-employment, and the youth’s delayed entrance into employment, coupled with the over-burdened pension systems, are major problems in the U.S. and Europe. At a time when these issues have risen to the fore, it is perhaps worth considering more flexible labor market arrangements. While several solutions have been proposed, we are left wondering whether there would be public receptivity to changing labor market arrangements. While this is hard to predict, what we can measure – and did in our new paper – is the well-being costs and benefits of different work arrangements. As we argue in the study, different employment and retirement arrangements may be appropriate for people at different stages of their lives, depending on their career goals or innate well-being levels. Understanding how employment, retirement, and late-life work relate to well-being can contribute to ongoing public policy discussions. In an analysis of Europe and the U.S., based on Gallup World Poll data, we discovered that voluntary part-time workers were happier, experienced less stress and anger, and had higher job satisfaction than other employees. 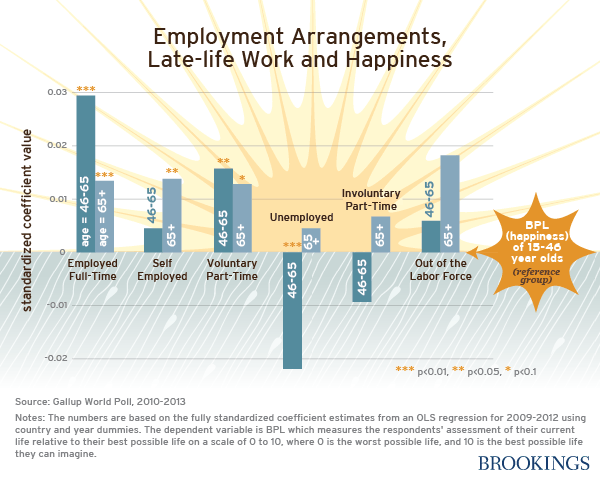 We also found a “happiness premium” among older workers working full-time or voluntarily employed part-time. And late-life workers (i.e., those working past retirement age) working full-time or voluntarily employed part-time were typically happier and more satisfied with their health than their retired counterparts. The positive effects were greatest, meanwhile, in those countries where more flexible labor market arrangements were more common (and thus publicly acceptable). Of course, not everyone has the luxury of choosing to work part-time, and many of those workers who choose to work beyond the retirement age do so precisely because they like their work. Still, our findings provide some food for thought. Perhaps we can imagine a future where over-burdened middle- aged workers with children have more flexibility to work part-time, with late-life workers taking up some of the slack. . The latter would help ease the burdens posed by fiscally unsustainable pension systems. And more flexible labor market arrangements might also provide more opportunities (full or part-time) for youth to enter the labor market on a training basis as a first step. Our results cannot resolve issues of political feasibility and firm-level receptivity, among others. Yet as a first step, they tell us that there is a “happiness premium” for workers in more flexible arrangements. For more on Carol’s work, read her book, The Pursuit of Happiness.